Foreign Ministry issues official condemnation of attack in Douma in which chemical weapons were used. The Foreign Ministry on Monday evening issued an official condemnation of the Assad regime's chemical weapons attack in Douma, east of Damascus, two days after it took place. "Israel strongly condemns the chemical attack by Syria in eastern Ghouta on April 4, exactly one year after the mass killing carried out by the regime in Khan Sheikhun. 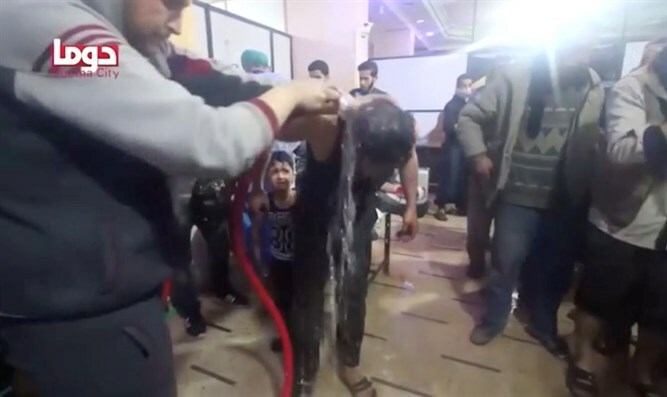 The Syrian regime continues to commit crimes against humanity using this prohibited measure," the Foreign Ministry said in a statement. "The latest attack joins dozens of incidents of chemical warfare by the regime since Assad pledged to dismantle these capabilities and clearly shows that Syria continues to possess deadly chemical capabilities and even to create new capabilities, thereby breaching its commitments and the decisions of the international community on the issue,” it added. U.S. President Donald Trump on Sunday warned the Syrian government it would pay a “big price” for the suspected chemical weapons attack. On Monday, he condemned the attack and said he would decide on a course of action in response to the attack within the next day or two.